In 1530 the Charles I of Spain gave the islands to the Knights in perpetual fiefdom in exchange for an annual fee of one Maltese falcon. The island was regarded as an outpost of Christianity and the huge fortifications of the capital, Valletta, were built with funds from the pope and the Catholic kings of France, Spain and Portugal, in order to discourage further attacks by the Ottoman Turks. In 1630 the pope awarded the Grand Master of the Knights of Malta equality with a cardinal of the Catholic Church. The Maltese ruler was henceforth addressed not just as “Your Highness”, like a king or “Your Eminence” like a cardinal, but as “Your Most Eminent Highness” — a perfect expression Malta’s unity of church and state. 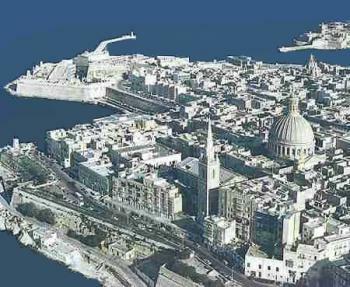 The religion of Malta is the Roman Catholic Apostolic Religion. The authorities of the Roman Catholic Apostolic Church have the duty and the right to teach which principles are right and which are wrong. Religious teaching of the Roman Catholic Apostolic Faith shall be provided in all State schools as part of compulsory education. 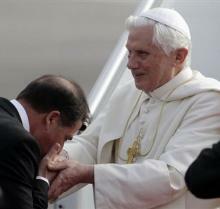 Malta’s President greets the visiting Pope in 2010. Then the national anthems were played. The Maltese anthem is a prayer for God’s blessing. In line with Catholic social teaching, it asks Him for employers who treat their workers with “mercy”. No mention is made of workers’ rights. In other words, the Catholic Church has a constitutional right to instruct the nation about what is right and wrong. In line with its adherence to Catholic doctrine, Malta secured an exemption when it joined the European Union (Protocol 7) in order to maintain its absolute ban on abortion. The referendum on divorce was held under the shadow of widespread and longstanding charges abuse of children by priests. Until 2011, the year of the referendum, none of these had led to convictions by the civil authorities. The Church said that it had received 84 allegations of abuse involving 45 Maltese priests in the previous 11 years  and its own investigation dragged on for more than seven years. The “punishment” finally meted out by the Vatican to the 13 priests that it felt were guilty “varied from not allowing them to exercise their ministry to limiting their pastoral work so that they could not work with minors and being placed under supervision”. The Church's constitutional duty to instruct the nation, appears to include its judiciary, as well. A good opportunity to do this is through the “Red Mass”, so called because in Mediaeval Italy the tradition began of judges wearing red robes. (A Red Mass for judges before they begin their year's work is held even in countries like the US and Scotland. In the latter the Presbyterian state church also conducts its own version, called the “Kirking of the Court”.) In Malta the Catholic Judicial Vicar took this occasion to say that secular courts manned by Catholics (and in Malta who else is there?) must effectively follow Canon Law. The Catholic Church spoke out against the “yes” campaign. 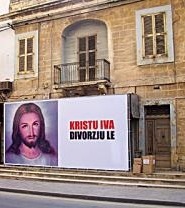 This included warnings that voting for divorce would be a rejection of Christ, with the Eternal Damnation that this implies, moves which prompted the Maltese MP whose private member's bill led to the referendum to call Church tactics “spiritual terrorism”. In this atmosphere the pressure to keep silent about favouring the option of divorce can be intense, yet many prominent Maltese spoke out. ♦ A Maltese judge (now safely retired) also spoke out. Judge Philip Sciberras said “The Church has every right (to impart its teachings on) divorce but it has no right to use undue influence on voters, which is a corrupt practice.” And he pointed out that the Electoral Polling Ordinance made it illegal even to threaten spiritual harm. ♦ After much soul-searching, even a Maltese Dominican friar came out against the covert electioneering of his Church. Fr. Mark Montebello accused it of waging a “stealthy” campaign, applying “immense pressure” and using a long list of dubious tactics. The friar’s charges are substantially confirmed by the news stories. A week before the vote a Maltese archbishop and two bishops issued a pastoral letter, “Opting in Favour of Permanent Marriage” in which he warned that the voter “must bear in mind that he shall be accountable to Jesus for his choice”. Not for his choice to refrain from divorce himself, but for his choice to forbid others to do so. In other words, not religion, but politics. And, this being Malta, a government Minister had no hesitation about stating publicly that “I am sure Our Lady is very sorrowful that Malta is considering divorce”. In other words, not politics, but religion. Yet even though nearly 3,000 18-year-olds were denied a vote because, curiously, an old electoral register was used, not the latest one,  the yes vote squeaked through with 52.6 per cent. The newly-elected Labour Prime Minister, Joseph Muscat, said in March 2013 that his government is "adamant on a clear separation of church and state." He said he had a mandate to "make the civil court supreme when it comes to marriage laws" and to bring in gay partnerships. However, he hastened to assure the Vatican that Catholicism would remain the state church — one thing at a time. Now Malta, the last country in Europe to legalise divorce, is the first in Europe to enshrine gender identity protection in its constitution! 3. This was the Code de Rohan, instituted by the 70th Prince and Grand Master of the Order of Malta from 1775 to 1797. 26. “Differing versions about Pope-PM talks”, Malta Independent, 25 June 2013.